A1C is an average measure of your blood sugar over the past 3 months. The results show how well your blood sugar levels have been controlled. The higher your blood sugars have been, the higher your A1C results will be. Your A1C serves as an important measurement of how well you manage your diabetes. Achieving your target A1C means a lower risk of damage to your eyes, kidneys, and nerves during your lifetime. It is measured by taking a small amount of blood and putting it into a device that reads your A1C in just a few minutes. You can eat and drink before the test and you will be able to continue your usual activities afterwards. 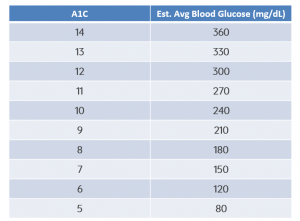 How does A1C compare to blood sugar readings? What is the A1C target? Your A1C target is very individual to your health needs and is decided by your doctor. Some people’s A1C target will be less than 7, but others may be slightly higher or lower. 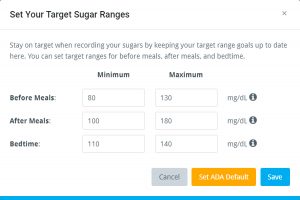 MyDiabetesHome uses A1C targets chosen by the American Diabetes Association, which highlights the importance of personalized goals. That’s why we allow users to pick their own targets based on their doctor’s recommendation! How often should A1C be tested? Your A1C should be checked at least twice a year if your blood sugar is stable, or as often as every 3 months if your A1C is not at your healthiest target. Here are some My Diabetes Home A1C Success Stories! One user, Jean, says she lowered her A1C from 7.6 to 6.9! We’re very proud to be able to provide our A1C estimator tool to anyone struggling with managing their A1C. You can learn more about how our A1C estimator works by watching this video. We’re even prouder to attribute to bettering your health, helping users understand how A1C works, and working together to change your diabetes.